The concept behind the Library Hotel in Midtown Manhattan, New York City is simple and straightforward. This boutique hotel, fashioned from a landmark brick and terra cotta building originally built in the 1900s, is home to more than 6,000 books in the front lobby and 60 individual rooms, all tied together by the Dewey Decimal System. And even if you never have time to crack a single cover, the simple heady twist makes for a stay that is somewhat of a cross between upscale and informal. But mostly, it's the homey feel and friendly staff that win people over despite plenty of other reasons to love the hotel. The Library Hotel makes for a great home base in New York City. In the late evenings, the rooftop bar turns into the Bookmarks Lounge, which is constantly ranked in the top 10 rooftop hot spots in Manhattan. Expect to see more white collar and resort attire than rumpled jackets and robed bohemes here, especially on Fridays when offices break for the weekend. It's probably even more true in the winter, when fewer people will want to enjoy a pricey drink on the outside terrace and cram into the penthouse atrium. It's still nice to know the views are right there on the 14th floor anytime you want them. 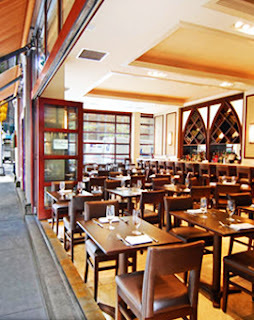 Likewise, the Library Hotel is home to the sometimes open-air and always upscale American Bistro, Madison & Vine. The menu for lunch and dinner is surprisingly reasonable, averaging $25 per entree for roasted organic chicken and wild trout for dinner (expect $31 to $50 per person). It would make a smashing place for breakfast, but the hotel serves a complimentary breakfast in the 2nd Floor Reading Room instead. Still, if you can hold off any hunger on Saturday until 11:30 a.m., Madison & Vine does serve a brunch menu beyond continental fare. It's well worth the wait. Smaller rooms make for an affordable stay in Manhattan. Since I was on my own, I stayed in a petite single. As the smallest room size in the hotel at 200 square feet, it is cozy even for one person. But the Library Hotel makes up for it in comfort, including the warmth of well-stocked bookshelves, each room with a theme. My room was stocked with poetry (the floor's theme was social studies). Most couples would certainly be more comfortable in a deluxe room, which are still small compared to anything on the West Coast. And anyone traveling with children has to opt for a suite with a pullout sofa. That's not bad. All suites are on a corner with three-way views of Madison Avenue and across to the New York Public Library. While the smaller rooms do not take advantage of highjack leather chairs to sell the theme, the larger ones do have chairs you can curl up in with a book (assuming you can, in New York City). But there are plenty of places where you can curl up throughout the property. And some people do, in the reading room, writer's den, and poetry garden when it's warm. Whatever room you pick, however, still comes with all the services and amenities. There is a complimentary selection of the American Film Institute's top 100, complimentary wine and cheese receptions in the early evening, and club privileges at the New York Sports Club to make up for the lack of a gym on premises. Manhattan makes everyone up for some exploration. While I was there last summer, well before Occupy Wall Street moved in to create its own political-cultural revolution mashup of sorts, there was plenty to see within walking distance of the hotel. 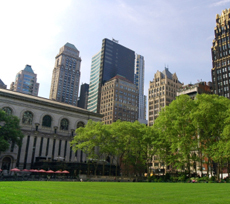 It is located near the New York Public Library and Bryant Park, Empire State Building, and Grand Central Station. The hotel's proximity to Grand Central was one of the initial reasons I considered it. It's only a block away, giving you full access to the city by subway. But you don't need the subway to hit most area attractions (just not the Village Underground). Most museums are less than a mile from the hotel, including the Museum of Modern Art. Broadway and Rockefeller Center are a mere half-mile away. And there are a few fun places nearby you'll want to tap: the Park Avenue Tavern (with self-serve draft), Slattery's Midtown Pub (depending on who's playing), and the Wharf Bar & Grill. There are some other clubs and ultra lounges in the area too. Just double check the dress codes before you show up in jeans like you're from California. The Library Hotel In Manhattan Bookmarks At 8.1 On The Liquid Hip Richter Scale. Staying at the Library Hotel is a casual contrast to the louder, more vibrant city around it. It's almost as if the hotel is a border town between two opposing cultures, with the more affluent having a slight edge over the free spirits. But I kind of liked that. It gives people who are used to more space — spiraling Los Angeles and hillside Seattle — a breath now and again. To make plans for New York, search for deals for airfares, discounted hotels, and car rentals on Fare Buzz. Nightly rates vary dramatically depending on where you stay ($200 to $2,000 or more), which is another reason the Library Hotel has always been an enticing choice.